There is a strong smell of oil paint as I write. This is due to my having the absolute delight of hosting for a short while a painting by John Noel Smith. I love this smell, which in the main I associate with studio visits. Here, in my home, I find that it reinforces the fact of this painting having a life of its own – and thus of it being an active presence in mine. Smith’s paintings seem to me to be very much alive, in that they are never neutral or static, are always active. They make their presence felt. They demand our attention and our response. The Fold Linear (No.1124 – shown left) at a modest 60 x 120 cm, has altered my perception of my personal space, has transformed the character, the feel of the room in which I work. This is the nature of art: at least profoundly felt, serious-minded art. This brings me to the reason why, in what is his first major show in the UK, Smith’s work is paired with the sculpture of Anthony Caro. This is not the only time their art has been brought together, for the pairing is sympathetic and complimentary. The two share an abstract language of bold forms and palpable physicality. Smith’s confident use of strong, diverse colours and geometries, is matched by the intensity, the controlled energy of Caro’s steel forms. There is poetry and toughness in the work of each. Both are capable of drama on a large scale, while being equally content to pursue their idea at a more intimate level. In their different ways they employ a language of assemblage: where individual elements are drawn together in the process of creating a unified statement. Lastly, but by no means the least importantly, neither creates cerebral art: this is art born of profound feeling, out of the artists’ experience of and emotional response to, the world in which we live. They share a motivational desire to make art of significance and meaning. John Noel Smith is one of the finest abstract artists working in Ireland today. Having lived for twenty-two years, until 2002, in Berlin at the heart of its vibrant artistic community he has an impressive record of exhibitions in public and commercial galleries in Germany, his native country and elsewhere. It seems inconceivable that work of this quality and importance has somehow slipped under the radar of the British art world – until now. Anthony Caro has, of course, been a central figure in the art of this country for over fifty years. Throughout these years, during which British art won and kept its place on the international stage, his constantly inventive work has played a pivotal role in the development of the language and materials of sculpture on both sides of the Atlantic. For over thirty years John Noel Smith has worked consistency within a relatively controlled, yet steadily expanding, formal vocabulary. As each new form has been introduced, he has spent time assimilating its potential in an extended series of paintings – as is the case in the three sequences, Pandect, The Fold Linear and The Fold Triangular presented in this exhibition. While engaged primarily with the abstract and geometric, he has at certain times none-the-less chosen to introduce the descriptive and representational. In at least two works (a diptych of 2002 and as one element in a five-part sequence from 1999) he has depicted his wife: love has a way of manifesting itself in the work of an artist. Also, whilst in Berlin in the late 1990s, the artist embarked on the extensive series of Knots paintings, where a lyrically painted network of interconnected knot-forms are set against (or perhaps ‘floating’ on, or above) richly worked abstract grounds. An example of Smith’s interest in the power and appropriation of symbolic form, his signature knots are close in shape to the Irish Shamrock or traditional Celtic Trinity Knot (the interlaced tripartite form of the ‘triquetra’). These introductions, cut across the abstract versus representation debate, and indeed in the Knots sequence, bring the two vocabularies into direct juxtaposition. For some critics this marriage of traditions went too far. But Smith’s art, at its heart, is concerned with oppositions and contrasts (some subtle, some not), of colour and form (shapes painted, as well as marks made); an art that pursues change as well as continuities. The division of his canvas into zones – sometimes real and sometimes painted – sets up an internal conversation between the painting’s elements that stand literally and metaphorically for the artist’s internal dialogue. As we engage with Smith’s work, we become aware of this encounter between ideas, expressed in paint. Like the paintings themselves, this dialogue is complex and multi-layered. It is concerned with the values and specific hues of colour and their mutual effect; and is between free, gestural mark making and the more structural, controlled and precise application of paint. It is a conversation too about the language of painting: between passages of single colour, set against repeated marks or particular geometric form (which may in turn be juxtaposed with variations of their own signature shape). It its multiplicity and diversity it is a dialogue that reflects the key issues and central debates within modernist art. Within the modernist tradition artists have often eschewed titles, believing them to distract from our encounter with the work of art, focusing attention too narrowly on specific meaning. For Smith however, titling his paintings is clearly important, and in this he embraces the human desire for order expressed in the naming of names. In art as in life, knowledge and understanding are layered. Smith’s visual language is self evidently capable of conveying meaning. His titles add another layer in our ability to engage with the paintings themselves, but also with the wider discourse within which he conceives them: that is concerned with concepts of communication and how knowledge is conveyed through visual codes. Previous titles such as Ogham, and Palimpsest (first used in the mid and late 1990s respectively) provide direct references to this underlying narrative in Smith’s work. The former title refers to the archaic (largely) Irish alphabet from the 4th-7th centuries AD, known from rock inscriptions and manuscripts; the latter title, to the practice by medieval scribes of scraping back the surface of a parchment or vellum manuscript page in order to re-use the precious material. In this process of overlaying, the original text can later re-appear as ghostly (often readable) ‘underwriting’. The term is also used more generally today to describe, among other things, the layering of archaeology, architecture, or even human memory. All art owes something to the art of the past. John Noel Smith’s most recent paintings carry echoes (like ancestral ghosts that once occupied our place in the world) of those that have gone before. Once Smith has applied a title to a sequence of paintings, the specific marks or forms he first introduced in that group, may be recapitulated again and again, within differing contexts, in later sequences of work: the origin or ‘back-story’ of individual marks or forms may be acknowledged in the title of the new work, as in The Fold Ogham series of 2011. In his creation of new formal characters and their variations, we see the artist’s continuous process of developing and expanding his personal vocabulary and its syntax, and thus enriching his visual language. The Ogham alphabet, thought possibly to derive from a simple system of recording tallies, is composed of oblique, vertical and horizontal strokes, linked by a solid line. The four columns of repeated horizontal strokes on the left of the middle panel in Pandect XIV (2011) refer back to the Ogham paintings of the 1990s, in which fifteen vertical stripes alternately carry a single colour, and a tight sequence of horizontal strokes, sometimes lightly linked together by vertical brush-marks visible beneath them – evident too in Pandect XIV. Also begun in the 1990s, the title of this particular series reflects the ambition of John Noel Smith’s enterprise: derived from the Greek, meaning ‘all-receiving, all containing’ a ‘Pandect’ is a treatise that encompasses, that grasps the meaning of, the whole of a given science. In the increasing diversity of Smith’s formal language, it is quite clear that familial relationships exist across apparently distinct themes and evolving series of paintings. New work, more often than not, references its lineage and its formal antecedents. For the artist, significant moments in the development and subsequent direction of his work are associated with particular paintings, as with Blackpainting, Red Lacerations of 1994. This is a dramatic and powerful image, made the more so by the inevitable associations of its title, in which the figure (the red vertical brush-stokes) and the ground (which of course is not a monochrome black) vie optically for our attention. The effect of this painting is still being felt in the new work in this exhibition, particularly (but not exclusively), in The Fold Linear sequence of images. There is an undoubted narrative within Smith’s body of work, which provides the unifying thread as his current interests ebb and flow, are engaged with and expressed. The Fold Linear and The Fold Triangular sequences belong to a wider family of several series that have in common the word ‘Fold’ within their differing titles. The reverberations in Smith’s use of this word are multiple, but most – from the bent and curved geological formation created by compaction or high temperature, to the culinary process of combining ingredients – have in common the idea of bringing together things that were previously separate to form something new. These associations seem to me relevant to Smith’s intention, while ‘Fold’ as a place of containment and protection, feels important too, as does by extension the sensation of being ‘enfolded’. The extended family of Fold paintings share the triptych format (the two outer canvases are separate from, yet attached to the central one), which of itself has a deeply symbolic resonance, in being most familiar as a configuration used in religious imagery. Smith also favours the diptych form, associated too with religious painting, or the hinged writing tablets used in Classical Mediterranean cultures. One of the interesting things about Smith’s adoption of the tripartite format, is that in physically attaching the three elements to one another, he subverts its traditional purpose: where the side panels function as doors (carrying imagery on both their inner and outer faces), which may conceal and protect the central, most holy image. In Smith’s triptych Fold canvases, the apparently quiet, modest wing panels are articulated and hence activated (given movement and form) by the geometric structure of the artist’s brushstrokes. Drawn across the canvas at different angles, enabling light to catch at the edges of the directional strokes and highlight the textural qualities of the paint, they generate a sense of space and depth within the painted surface. The colour of these outer panels is picked up and by juxtaposition with other hues, intensified in the central canvas. In Smith’s work the subdivisions within the image (and in The Fold Triangular series, the central canvas is itself ‘divided’ by distinct sequences of variations on the triangular form) carry equal weight: none is more important than the other and all contribute equally to the paintings’ dynamic. The latter owes much to the complex marrying of sharply contrasting even divergent forms, colours and surface treatments. Finally, I think it important to say that Smith’s art is an art of pleasure, his own and ours. This statement in no sense diminishes or makes light of what he does. The work tells us how thoughtful an artist he is, how dedicated to his practice, how concerned to push boundaries (his own and that of his media). This is painting about (the act of) painting and is thus about life, for painting is a language through which the artist mediates the experience of being human. This is why, where we are prepared to give attention, to allow a relationship to develop between the work and ourselves, we are rewarded with insight and understanding of what is being conveyed (carried) through colour and form, physical activity and its evidence in brush-marks and texture. Line, form, colour, surface texture and the signature brush-marks of the artist’s hand, are the vocabulary of the painter’s language. Within it we discover narratives about the forces that animate our lives. 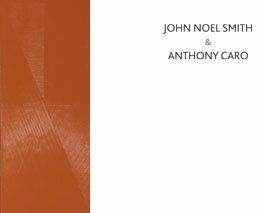 John Noel Smith & Anthony Caro. Waterhouse & Dodd, London, England, 2011.